This is me when I ran the London Marathon. Yes, it was hard, it was a struggle. It was painful. It was an experience. It was amazing to cross the finish line and feel the satisfaction that months of training had paid off. The other runners were great peers in this challenging event, and so were the road-side supporters. What was even more amazing was what happened several months later. The sponsorship funds of over US$50,000 that we raised together, made it possible to put a new roof on our local Hilarion Home. The Leonard Cheshire Hilarion Home is just down the road from us, if you’ve been here, you’ve probably seen it. My wife, Annie, is on the board too. You can read about what we achieved together here. The home is where many vulnerable people live who are either elderly or who have a disability or condition which prevents them from enjoying an independent life. The roof now in place is as much hurricane proof as it can be and strong enough to keep them dry and protected, no matter the weather. So I want to propose that we do it again. 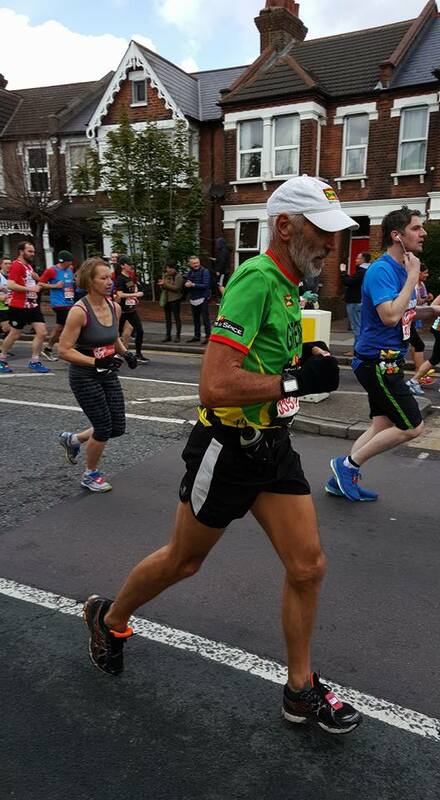 From my perspective, the London Marathon is a challenge, but it has great camaraderie and taking part is one of life’s highlights. However, as we mature, we realise that the greatest joy in life comes from giving, so I’m running with a purpose for another worthy cause. I’d like to ask that with your help, we raise £5000 for Attach A Leg Grenada. In exchange, I will run the 26.2 miles of the Virgin London Marathon on 28th April 2019. I’ve chosen this charity as the outcome of the work they do is transformed lives. We’ve seen it in progress and have witnessed the incredible positive changes that it brings to people’s lives. 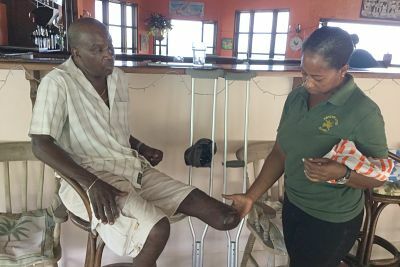 The husband of our head housekeeper, Aren, unfortunately, went through an amputation caused by diabetes – a commonplace condition in the Caribbean. Martin was finding the situation very challenging to handle and without mobility was struggling to find a purpose in life. He became depressed, withdrawn and was mentally and emotionally suffering. Fortunately, Annie decided to get in touch with Attach A Leg to see if they could do anything to help. Gilfi is the name of the director of the charity, he said he’d visit. To cut a long story short, Martin was fitted with a new prosthetic and his life is now pretty much back to normal. The most remarkable part of the entire process for me, was when Gilfi met Martin at Petite Anse. Martin hobbled into the compound on crutches, but he walked out on his new leg. It was truly unbelievable. It was ‘heart-grip’ touching. It was one of those moments that grabs you round the throat and prevents you from swallowing as your eyes sting with the ‘wet stuff’ of emotion. Martin can walk. Apparently, he can run! And he has been able to return to working the land and growing his produce. His life is back to a place where he can enjoy it and gain fulfilment. So please dig deep, let’s help others to walk again. Some of the amputees who approach Attach A Leg for help can afford their own prosthetic, but for the most part, they cannot. They may have been suffering from wounds or sickness caused by diabetes for several years prior and living in financial hardship. The Caribbean is a region that is not as financially fortunate as the bigger countries, and sharing is caring and joyful. Please donate, even if it’s the smallest amount. It would be very satisfying to get more people back to living a life that they enjoy and participate in. Let’s help them to stand up and get the same enjoyment that me and you take for granted.